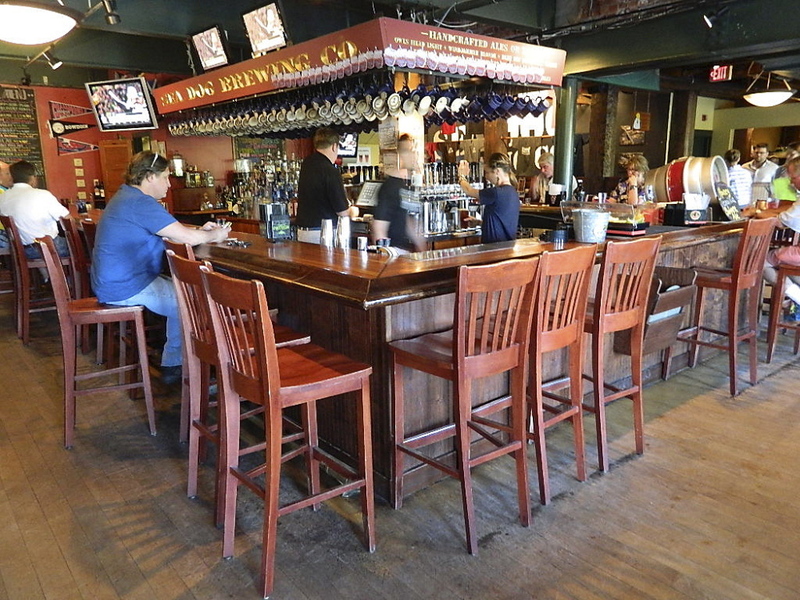 Sea Dog Brewing Company and Maine State Music Theater are the perfect pairing. The only disappointing thing about the Maine State Music Theater is that Linda and I only manage to get there once each season. Every musical we’ve seen there over the years has been exceptional. Don’t be discouraged if the parking lot is nearly full. The restaurant is huge. 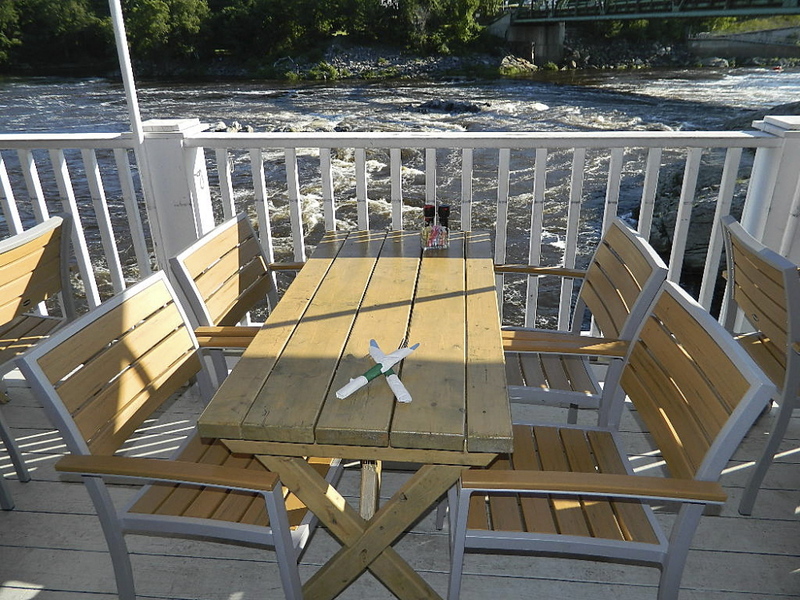 And definitely eat on the deck if you can. This summer, I chose the musical without consulting Linda. I love history and wanted to see “Chamberlain, a Civil War Romance.” OK, it would not have been Linda’s first choice, particularly after she heard from friends that the first musical of the season, “The Buddy Holly Story,” was so fantastic. I sweetened the evening by suggesting dinner at the Sea Dog Brewing Company in Topsham, one of our favorite pubs. We’ve probably written about the Sea Dog more than any other place — including their amazing Sunday brunches. Last year, arriving in Portland following two weeks in Italy, we bee-lined it to Topsham for one of the Dog’s great burgers. No burgers in Italy! 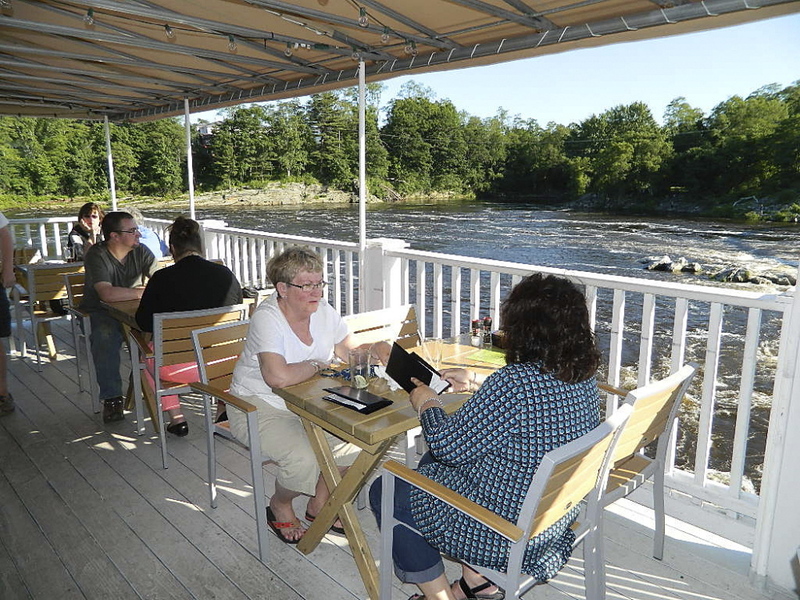 While a bit disappointed that every table on the outside deck (overlooking the Androscoggin River) was taken, we took an inside table by a window, enjoying the air conditioning on a very hot day. We had just one hour to spend at dinner and were pleased by the fast, attentive service. Not long after we ordered, we spotted long-time manager, Seth, clearing tables. He also delivers food. Seth does it all here! Given that Sea Dog brews many fine beers, we didn’t need an excuse to start with two of our favorites, Old East India Pale Ale for me, Owls Head Light Ale for Linda. Very refreshing. The Sea Dog’s menu is unusually long and creative for a pub. They include suggested food/beer pairings and list the farms where they got the ingredients. There are lots of seafood dishes, steaks, salads, burgers (of course) and an entire section of Italian choices (Littlenecks and Linguine for $16 looked good, as did the Pistachio-Basil Pesto Pasta for the same price). My eyes lingered for a while over the Baked Fisherman’s Pie for $15. There were 10 items just on the specials menu and they all sounded delicious, from the Fried Oysters for $11 to the desserts that included fresh strawberries, vanilla waffles, peanut butter cup ice cream and chocolate sauce. Wow! Linda and I focused on the specials because we like to encourage chefs to be creative. I ordered the Smokey Cuban ($14) — smoked and pulled organic pork shoulder, mustard sauce, provolone cheese, fennel-dill slaw, Canadian ham and mustard pickles. The pork came from Dragonfly Farms in Durham. 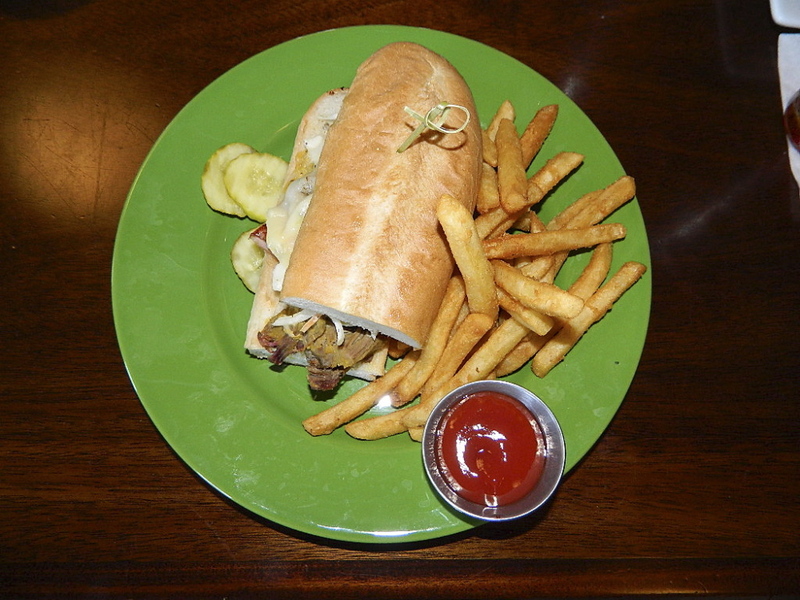 I have eaten Cuban (Cubano) sandwiches from Maine to New Orleans. It’s probably my favorite sandwich. The Sea Dog’s was one of the best I’ve ever eaten. It was packed with meat and slaw, and really messy. Just the way I like it! The tart mustard sauce and pickles gave it a lot of pop. Even the bread was special. And the fries that came with the sandwich were nice and crispy. Bob and Pat Morang saw us on their way out. Bob’s a church organist and public school music teacher, so he really knows music. He and Pat had just seen the afternoon presentation of “Chamberlain” and raved about it. They were right. The show was fantastic. 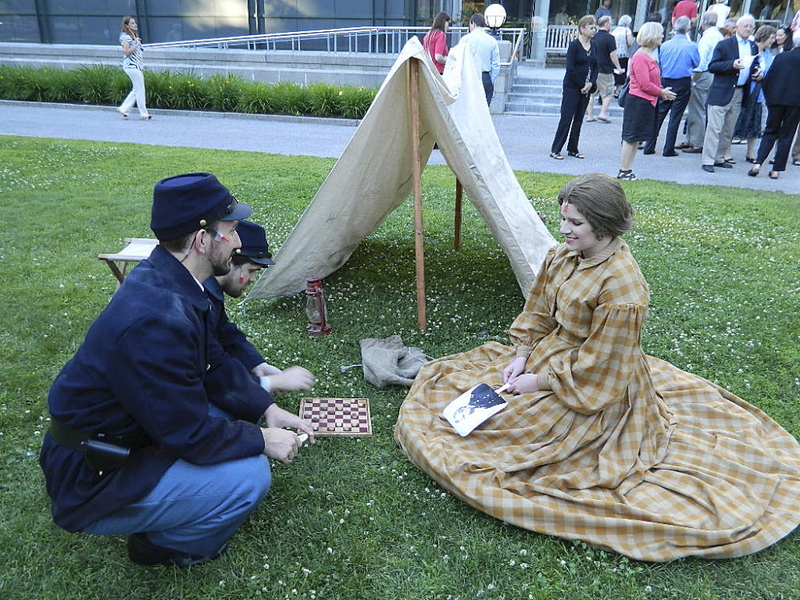 We got to the theater in time to enjoy the outside Civil War “encampment” and a wonderful group of young people — in period dress — singing for us. In our press packet at the Music Theater was a paddle with Joshua Chamberlain’s picture on it. The good news is that Linda enjoyed the musical so she didn’t use the paddle on me! Dinner and a musical — what a great way to spend a Maine summer evening. Our dinner at Sea Dog with a view of the river was followed by a stroll on Bowdoin’s beautiful campus. The show itself was great. 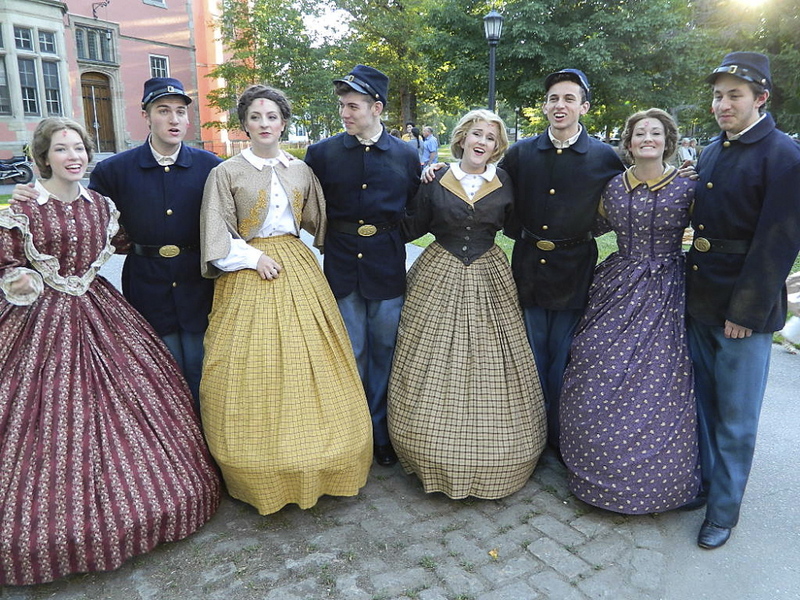 Great costuming, sets and songs performed by wonderful actors are all things you can count on at the Maine State Music Theater. Every time I see a show here, it makes me regret that we are not season ticket holders. There are burgers galore here, including two kinds of veggie burgers. From past experience I can tell you that they are very good, but I witnessed their magic effect this visit. We were sitting near a dad and his little girl who was less than 2 years old. She was a very vocal baby and he was doing everything he could to entertain her. When her burger arrived, she went silent. Let’s just say that she really focused and made short work of it! I wish I could have taped it. It certainly made me smile. This trip I noticed the tempting specials menu and ordered the Brewers Tenderloin Tacos ($15). 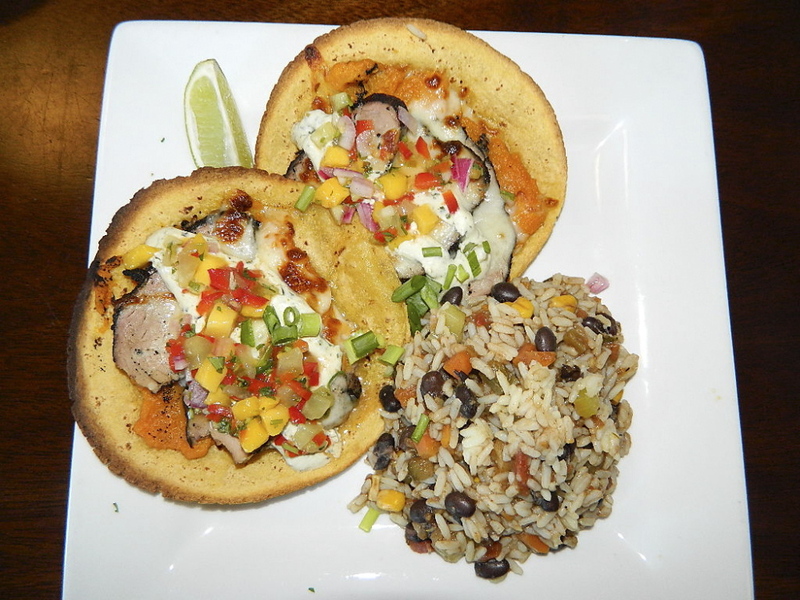 Soft corn tortillas held BBQ coffee-crusted pork tenderloin, sweet potatoes, cheese and fruit salsa. With tasty black bean rice and jalapeno sour cream on the side, I was a very happy diner. The fruit salsa makes this dish, but I loved the sweet potato in the taco as well. The pork was well-seasoned and very tender. This was the most spectacular taco I ever remember eating! To top it all off, it was not messy. Now that’s perfection. I sure hope they have this dish on the menu the next time we eat here. At the theater afterwards, I spotted a lot of people we’d noticed at the Sea Dog. I swear everyone at the theater ate there, too! They are a perfect combination! Jen Hazard knows tourism and travel. She lives it. Jen and her family are featured in a Maine tourism video this year, promoting family travel in our state. Jen noticed that the tourism website had nothing for young families, and reached out to them to fill that gap. You can see her video at vimeo.com/87023104. She is also the social media staffer for Islandport Press in Yarmouth. And she’s got her own website, www.cutepotato.com, a terrific source of information for parents. You can join her email list and access her family travel blog at www.jenhazard.com. Jen originally focused on promoting events and places that appeal to kids and their parents. Today the website offers all kinds of helpful information from books to restaurants. In fact, when I stopped in last week at Islandport Press to pick up more copies of my book, Jen had a list of restaurant recommendations for the Travelin Maine(rs)! And they sure sound great!